Lately I've been really into online shopping. Wisconsin really does not have a surplus of good stores, and as much as I would love to go to Chicago every few weeks to look at new products, I obviously don't have the time to do so. That being said, online shopping is my savior and I don't know about you, but I find it really therapeutic! (They don't call it retail therapy for nothing :) Since I'm starting to save up more and more for college, spending a lot of money on clothes is just not in the cards. But, that doesn't mean I can't find some less expensive alternatives to my favorite expensive pieces! 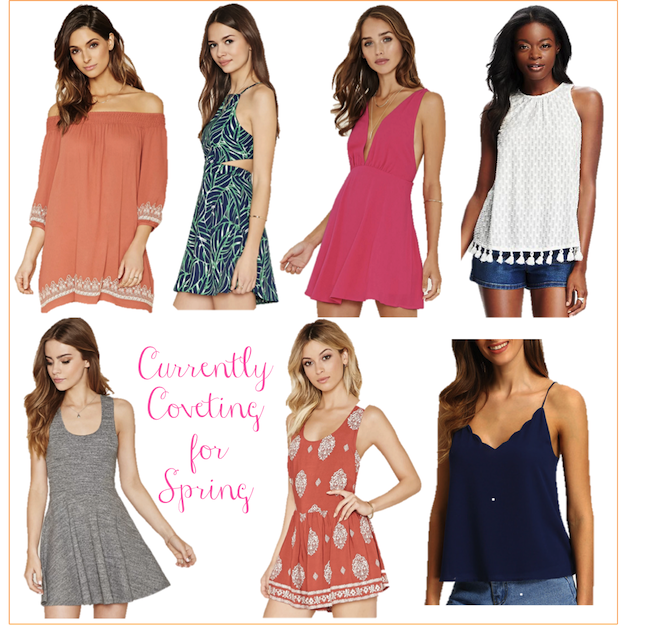 I've rounded up a few goodies I'm loving for spring and summer and you can shop them all above. Dress wise, I'm loving the swing and cut out trends, especially the palm print cut out dress! For tops, tanks with fun details are on my radar, and I'm dying for a scalloped cami like this one from J.Crew. Rather than paying over $100, I found this navy version for $15! Such an amazing steal. Rompers are my other addiction at the moment, and while it's often hard to find ones I like, this orange print one looks absolutely perfect. And the great news is that all of these pieces are under $30!! Are there any particular trends you're dying to try for spring? Love all these pieces! Thanks for sharing cute, affordable style for students on a budget!